The Ninth Circuit decided it will rehear our case later this year, taking the rare step of withdrawing the earlier decision by three judges. This remains just a proposal and there is still time to fight back, but the fear and confusion created by this announcement has the potential to be just as damaging as the proposal itself. While the President's executive order claims that the administration will end their policy of separating children from their parents at the border, in reality, families are still apart at this very moment. Answering your questions regarding Attorney General Sessions heartless decision affecting asylum seekers. The U.S. Supreme Court announced that it agreed to review two class actions involving the right of immigrants in detention to have an opportunity to seek bond hearings from an immigration judge. If President Trump had his way, today—March 5—would mark the end of the Deferred Action for Childhood Arrivals or DACA program. Last week, the U.S. Supreme Court issued two rulings that have a significant impact on immigrant and refugee communities. We are pleased to announce that Malou Chávez has been selected as NWIRP’s first-ever Deputy Director. We are celebrating an important court victory that will allow us to advocate on behalf of community members who had been denied immigration protections. The Department of Justice is trying to stop us from helping immigrants facing deportation, so we took them to court. Read about how we've been defending and advancing immigrant rights since the election. We believe that, rather than spending months on a review of private immigration prisons, DHS should be taking bold action now to eliminate the use of private contractors for immigration detention and radically decrease the detention of immigrants, period. Each week, in immigration courts across the United States, hundreds of children come before immigration judges and are forced to represent themselves against deportation. Can a 3-Year-Old Represent Themselves in Deportation Proceedings? 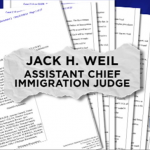 The top Department of Justice official in charge of training immigration court judges believes children, even children as young as 3-years-old, can represent themselves in immigration court. Northwest Immigrant Rights Project continues to protect individuals from violence, keep families together, and change immigration policies on a national level. Here are a few highlights from another year of defending and advancing the rights of immigrants. We are honored to be receiving the William O. Douglas Award, the ACLU’s lifetime achievement award, for our three decades of work to ensure that our legal system enforces the guarantees of the Bill of Rights to all people in America. Pictures and a powerful client story from our happy hour event in central Washington. How the current crisis in Europe is a tragic reminder of how limited our protections for asylum seekers are in the United States and internationally. This video recaps some of our largest victories from the past year. We've put together a glossary of common immigration-related terms to help you better understand them. Check out this incredible video featuring interviews with our clients, produced for our 30th anniversary gala. NWIRP Board President Monika Batra Kashyap explains why using the term "illegal" is both legally and morally wrong. Our Executive Director shares his thoughts on May Day 2015 and NWIRP's involvement in the peaceful march.